You can now overlay your design on a Google Map from within Butterfly, and you can use this to present your plans and to make drafting on terrain much easier. 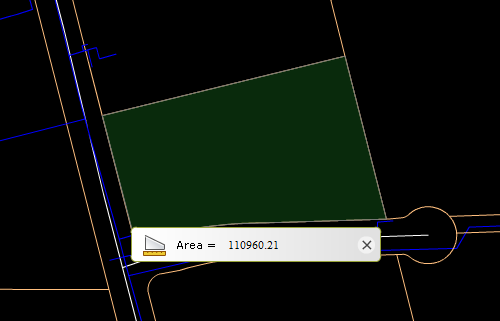 Using maps in Butterfly can be useful to a variety of fields, such as residential, environmental and governmental. A few examples include planning infrastructure design, urban planning, or just placing your house plans on the site. More than a drafting tool, overlaying designs on maps makes a powerful presentation tool. Drawings come to life, and can be understood in the context of their surroundings. With the map in the background of your drawing, you can collaborate on the drawing. Share it, review it, co-edit it, or even publish a link to it – it all works with the map or image that you’ve chosen. 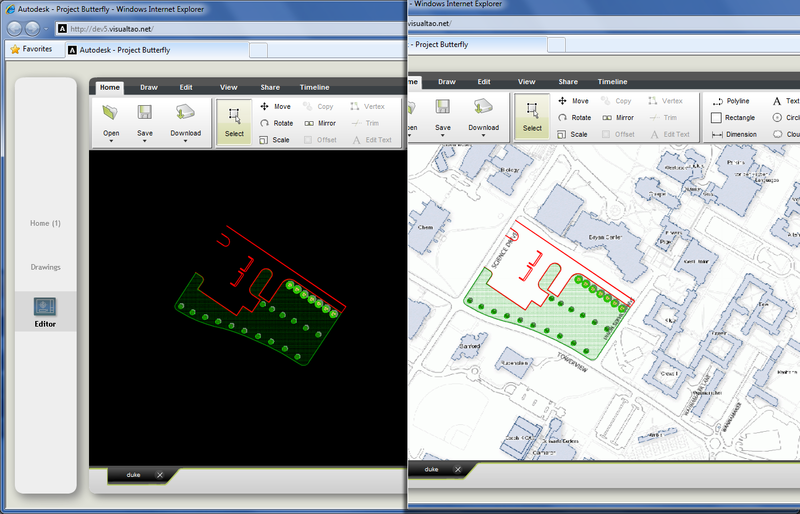 You can now import a drawing with a large raster image background that you setup in AutoCAD. Butterfly now supports over 20 popular image formats to serve as background to your drawing. We support all formats natively interpreted by the GDAL library. Project Butterfly’s support of large images enables drawing over older drawings which are only available in printed or scanned form or over satellite and aerial imagery of the site. Just like with Google Maps in Butterfly, you can share and collaborate on drawings with raster underlays. We have made it easier for users to start collaborating on their drawings. Starting now, you only have one place to look for if you want to collaborate – whather its sharing your drawing, co-editing, or starting a design review. 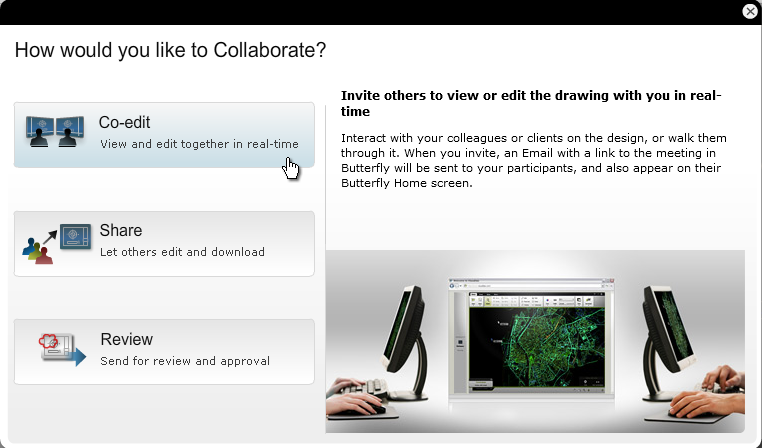 Each collaboration option has description text next to it, so you can easily find the right option for the task at hand. You can find this window by clicking the large “Share and Collaborate” button. 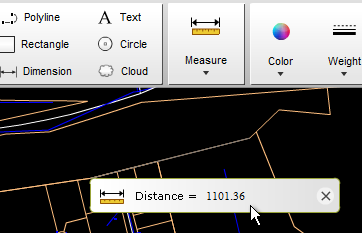 Another addition to the latest version of Butterfly is the Measure tool also found in AutoCAD.You can now measure distances and areas in addition to drawing persistent dimensions. We’d love to hear feedback from you. Write to us in the comments below, or use the Feedback link in the application. Campus map courtesy of Duke University. There is no affiliation or endorsement between Autodesk and Duke University. This entry was written by Butterfly, posted on March 28, 2010 at 7:55 AM, filed under News. Bookmark the permalink. Follow any comments here with the RSS feed for this post. Post a comment or leave a trackback: Trackback URL. That’s just great! G-Maps under a drawing is a great help. The option of integrating google maps is very good. We work hard in the studio with orthophotos, but sometimes we do not have google maps and ince great help but to have it built, the better. I wish it integrated into the next desktop version of Autocad. Worked great out of the box. I exported my architectural drawing from Revit, imported and georeferenced it to the map within 5 minutes no problem. I exported as a PNG and got a small glitch where it misplaced the drawing, but the second time it worked fine. Glad you mentioned GDAL. For those new to it, it’s a powerful set of data access libraries (and conversion tools!) from http://osgeo.org. Well done, and thanks for the email blast notice of these new features. Like 1/1000 and Lambert 2 expanded. Thanks for all the compliments, guys! Tyler – We want to be able to underlay the rasters on directly in Butterfly, but that might take us a few months. Do you work with GoogleMaps/GoogleEarth team ? Can you imagine a complete and acurate model of the Earth from which each project will be drawn (more waste of time collecting data to redraw the background, all will be already there) and also modeled in 3D (Google Maps now includes a EarthView ). In words, we will get it a numerical model of the Earth’s exploitable and continuously updated by each architecture team. Exciting isn’t it? (Excuse my bad English … I’m French). We do not work with the Google Maps or Earth team. Their product provides us with an API – an interface, through which we combine data from their service into our application. Your vision sounds like the direction the software world is heading onto, but that’s only thoughts and imagination right now. If you locate greater Bookmarking Demon offer somewhere else, write me, Ill include more value and provide it to you for free!